Another fiery sunset in Destin, FL. Spending 2 months in Destin, FL was remarkable for how incredibly UNremarkable it truly was. And that’s not a bad thing, honest. The living was easy in Destin. Easy and good. Nearly everything I craved (with the exception of a jonesing for Sri Lankan food that left me weeping for the memory of Manhattan) could be found. The prettiest beaches in America? Check. Amazing sunsets? Got ’em. Excellent, fresh seafood? It’s plentiful in the “World’s Luckiest Fishing Village.” A surprising array of upscale shopping? Well, I never actually craved that, but hey! It was there, too, if needed. I’ve said before that we set out hoping to find a town that would let us hunker down and work without distraction while still keeping us entertained. Destin exceeded our hopes and left me downright smitten. I loved this town, and even more, the neighboring towns of Seaside, Grayton Beach and Rosemary Beach. I adored my apartment with its Gulf Coast views, and my proximity to turquoise water, and the sensation of warm sunlight beating down on my skin in early December. Yes, Destin was easy. Now, I like easy. But there’s also something to be said for feeling challenged. I enjoy knowing a massive Publix supermarket with more foodstuffs than a small nation lies a 5-minute drive down the road. Of course, I also like walking into an Italian village’s butcher shop, feeling a moment of panic when I forget the word for “steak,” and proceed to use sign language and make guttural mooing noises to order a hunk of meat — never entirely sure what the heck I just purchased. 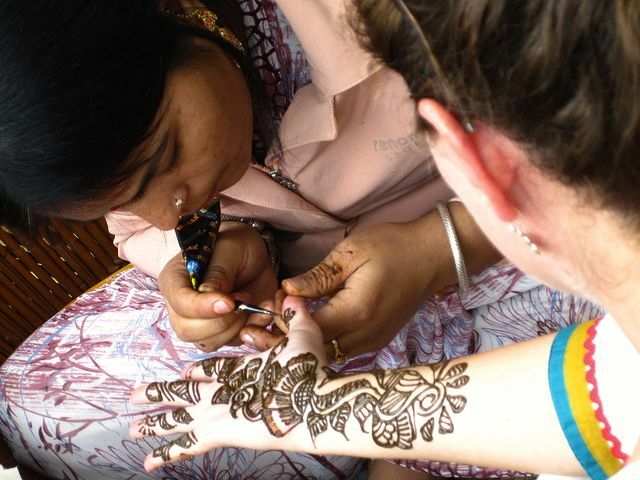 Dipping into the Mehndi culture in Pushkar, India. Fumbling along in a foreign language, learning new cultural norms, getting profoundly lost without a map, seeing sights I never fathomed existed, learning and learning what it is to be human in this great, wide world — well, it’s not always easy. But to me, it’s wonderful. It’s how I want to connect with the world around me: by experiencing as much of it firsthand as possible. This ache to travel wider and farther has been tangible lately. I’ve covered good ground in the US this past year, but vestiges of my ’round the world journey keep popping up — visions of foreign lands and people dance in my head. So, what’s a nomad to do? Or, more aptly, where’s a nomad to go? The next destination on this great journey is booked: I’ll be calling Buenos Aires, Argentina home for 2 months, followed by another 2 months traversing South America — specifics as yet unknown. We have a tiny apartment in the Palermo Hollywood neighborhood, because, hey, we’re rock stars like that. I can’t wait to eat my face off, drink Malbec, and learn to acclimate to a culture that eats dinner at 11 p.m. when I prefer going to bed old-lady early. Hopefully, I’ll be improving my feeble Spanish language skills, tango dancing without falling over, tossing back cafe con leches with abandon, making new friends and exploring a country I’ve spent little time in previously. I’m jazzed to be in an urban setting, where culture, history and the arts are in easy access. So it is that I’m dusting off the old backpack, and man, it feels good. I have recurring twinges of excitement in my belly that I haven’t felt in a long while — it’s the sense of imminent adventure. Of challenge. As always, I loved reading what Passenger Conners had to say, and I look forward to your next adventure in Buenos Aires. You’re a very special and gutsy gal, Valarie…..I’m afraid to leave PA, but maybe that day is coming. Love you….. Thanks melyssa 🙂 We are so excited! We’ve both been to BA before, but I’ve never traveled outside the city except for a quick day trip to Uruguay. If you have any tips, let me know for sure!